Tour lasts approximately 2 hours. If you like nature you will love this experience. It is the perfect chance for you to see beautiful aquatic creatures and enjoy nature like you've never seen before. 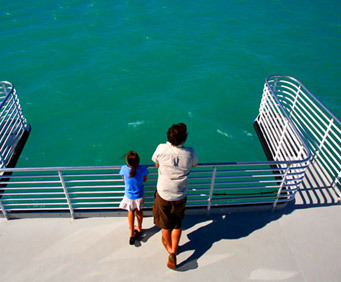 It is a family-friendly adventure and your entire family will love seeing Marine life and the nature of Key West. These are some of the most beautiful creatures you ever see and it will be the time of your life. If you're looking to get away from everything then this is the perfect opportunity to have with your family. This is great to our glass bottom experience that allows you to look through the bottom of the boat and see the water as you go along. You will have a friendly and professional guide who will show you everything you need to see and give you the most fun you can have. This is the chance for you to have a close encounter with wildlife and have fun on a whole new level. It is also the chance for you to enjoy a relaxing time in nature we can have a lot of fun and excitement. You will see the only living coral barrier reef in the Continental US and lots of other places as you relax and travel around and have fun. You'll see lots of corals, sponges, lobsters, sea turtles and a lot of other wild animals as they go on and live in nature. You will enjoy delicious champagne and soft drinks and you also get to watch the sunset as well. There are so many cool things for you to see and do that you will have the time of your life on this glass bottom boat experience. It is the perfect opportunity for you to really connect with nature and get away from everything. 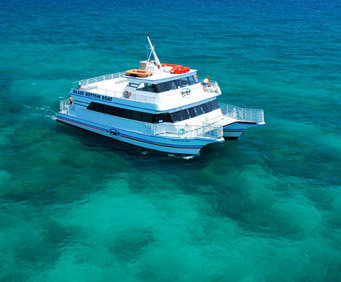 See the only living coral barrier reef in the continental United States on this two-hour glass-bottom boat tour from Key West! As you relax on the cruise, look down below your feet to see the reef, which is teeming with tropical fish, hard and soft corals, sponges, snails, jellyfish, anemones, crabs, lobsters, rays, sea turtles, nurse sharks and other sea life. Upgrade to the sunset cruise to enjoy Champagne and soft drinks as you watch the sunset. When you're in Key West, don't miss this opportunity to see dramatic underwater vistas generally reserved for snorkelers and scuba divers! On this glass-bottom boat tour, a wide variety of fish and other sea creatures can be seen below your boat's clear, glass bottom. You'll cruise over Florida's beautiful reef, the only living coral reef in the continental US and one of the most biologically diverse marine eco-systems in the world. See majestic Elkhorn coral and eerie brain coral, sturdy in appearance yet fragile and vulnerable, as they stand still while more than 300 species of fish and other sea life swim around the reef, completing the colorful seascape. During the trip, your experienced captain and crew will provide commentary about the reef and will point out some of its most interesting marine creatures. 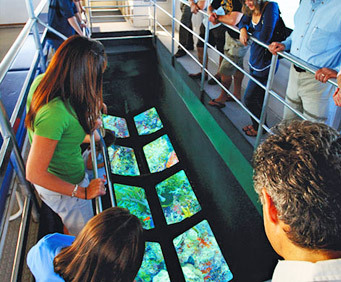 The boat's glass bottom provides continuous viewing for all passengers. Upgrade to the sunset cruise to complement your underwater sightseeing with the gorgeous Key West sunset. As you watch the sun slowly disappear beyond the horizon, sip on Champagne and soft drinks (included).